Melvin and Dorothy Ortner of Mapleton will celebrate their 70th wedding anniversary on April 26. Their children are Tom and Karen Ortner of Yuba City, CA; Marsha and Doug Craig of Mapleton; Bob and Carol Ortner of Goodland, KS; Marilyn and Jim Anderson of Sioux City; Joe and Barb Ortner of Minnetonka, MN; Julie Ortner-Goodin of Dakota Dunes; and Jean and Pete Kerr of Sergeant Bluff. The couple has 18 grandchildren and 40 great-grandchildren. 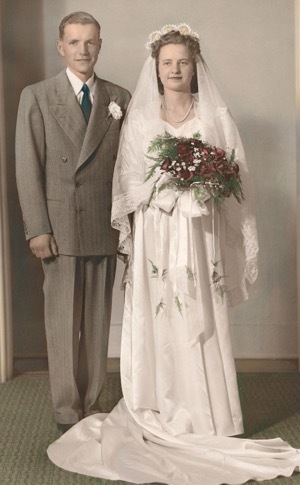 Melvin married Dorothy Lee at St. Mary's Catholic Church in Danbury. A family celebration will be held in June. The children of Andrew and Maureen Wede are happy to announce the 50th wedding anniversary of their parents, Andrew and Maureen. They were married on April 12, 1969, at St. Mary's Catholic Church in Danbury. Their family includes four children and their spouses: Krista and Paul Wheeler of Olathe, KS, Scott and Kristi Wede of Manhasset, NY, Kim and Ray Prado of Glenview, IL, and Jennifer and Joe Tippins of Wilmette, IL. They have thirteen grandchildren: Ellie, Adam, Emma Wheeler, Kate, Michael, Luke, Jack Wede, Alex, Ryan, Thomas Prado and Adeline, Maren, Leo Tippins. A celebration will be held later this summer. Kathy and Warren Warren of Danbury celebrated their 50th wedding anniversary on March 22nd. The couple was married on March 22, 1969.